While trying to make the process of purchasing faster, you still need to gather information about customers. When this is the case, use Magento checkout fields to add additional fields to the checkout in your online store. You can easily manage fields for your clients to fill in. 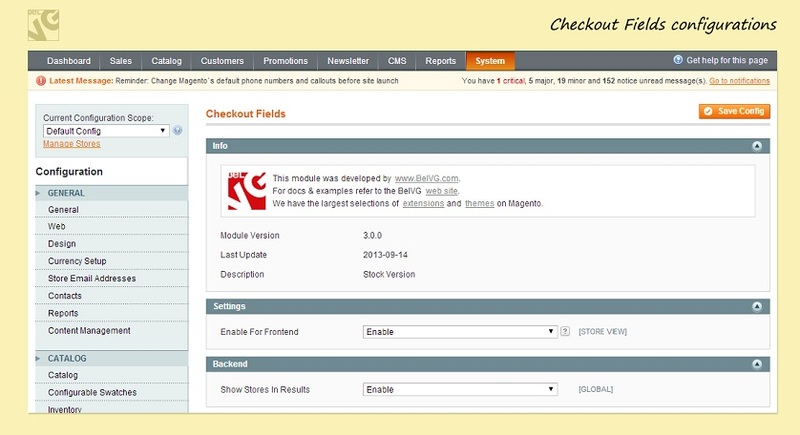 Magento checkout fields module is very flexible and easy to install. Set dates for the fields to appear and disappear on frontend automatically. You can now easily add custom fields to any checkout steps with Magento Checkout Fields extension. Any type of field – selects, text, radio buttons, etc. Make them required or not, add validation, add different fields for different languages or stores. It is really easy to edit fields and gather statistics. A perfect choice both for specific cases where you require some information from the customers and when you just allow them to answer a couple of questions for you. Enable for Frontend – enable or disable extension on the frontend. Show stores in result – choose whether to show stores in the statistics results. To create a new checkout field go to Sales ─> Checkout Fields. Here you will see the list of all fields. Press “add new” button to create a new field. First you will see the Properties Tab where you have to choose the field name and its type. Default value – enter the default value for this field. If your store operates different languages, choose Manage Label Tab and insert field name in the forms provided. On this page you can also add and manage Options (values of your field) if it is necessary. Then go to Steps and stores tab. 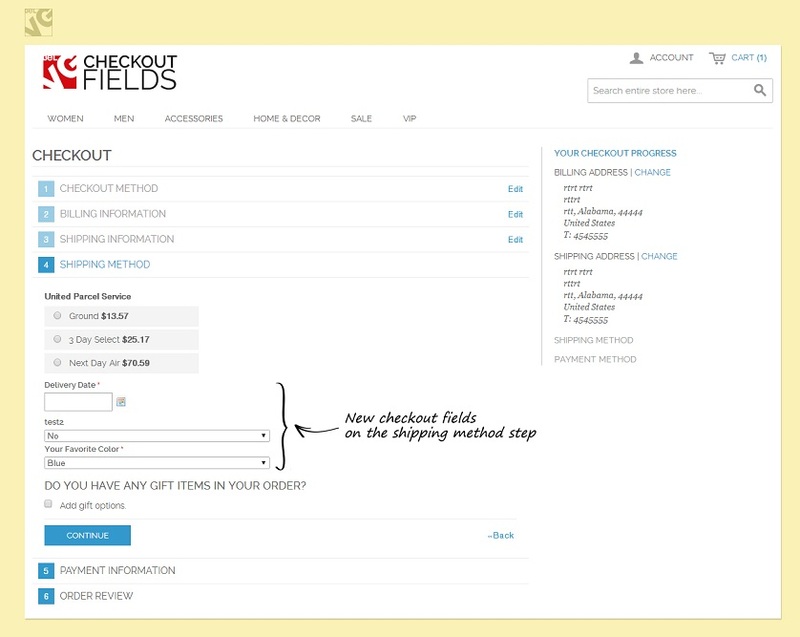 Here you can choose the checkout step for every store where the field will be displayed. Tooltip – enter the tooltip that will be displayed near the field to help customers to fill in the field. Press save button to create the new checkout field. In the list of all checkout fields you will see the action buttons to view statistics, edit or delete field. If you press the statistics button you see the popup with the field statistics for all stores (if configured). You can switch the statistics between quantity and percent. Sort order of the attributes at the frontend is completely repeats of sort order in the list. You can change it by dragging the rows. 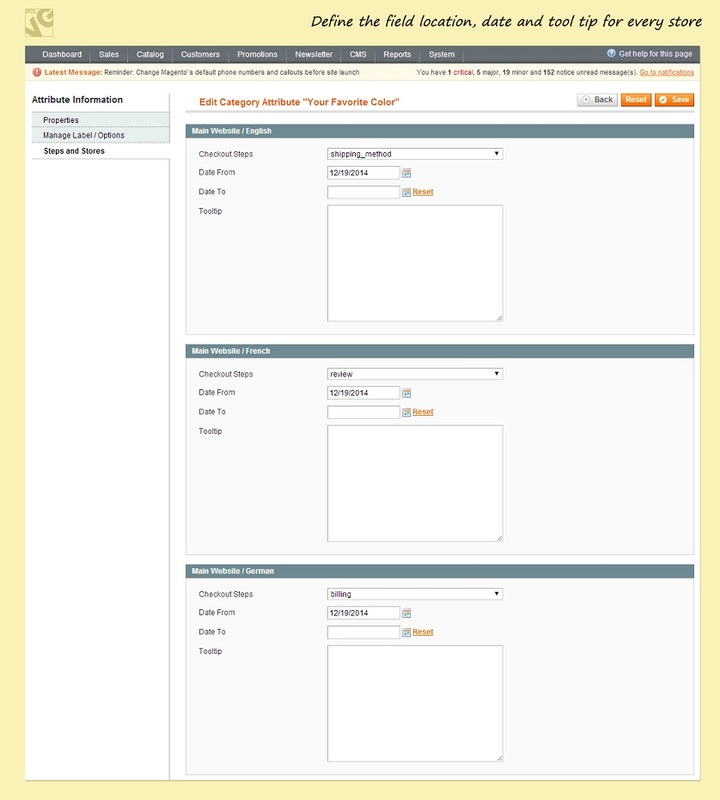 Note that the custom checkout fields are placed after the standard fields on the frontend. You can easily select store view and see fields only for a particular store. After you choose the store you will see the fields for this particular store and can easily and quickly manage them right in the list. Here you can change the checkout step. You can also sort fields using the filters at the top of the list. 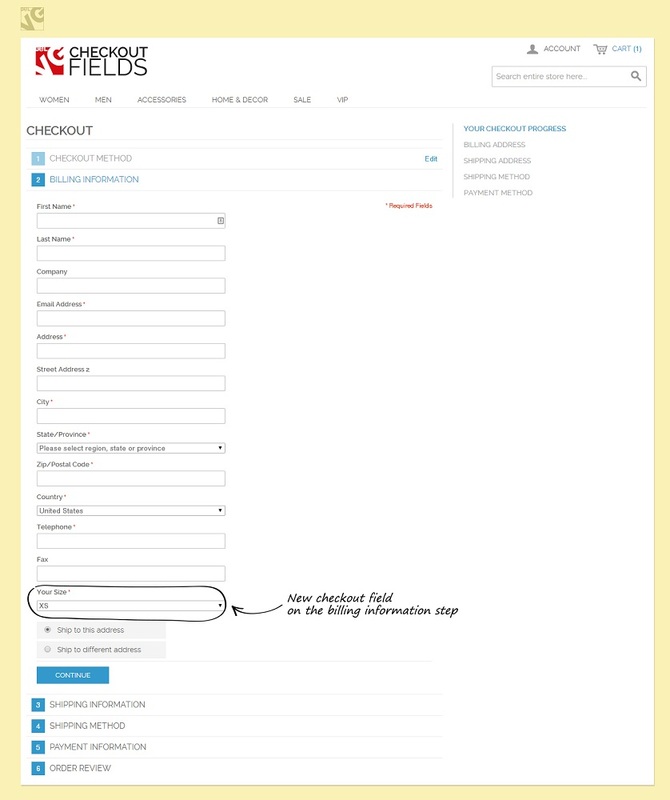 Checkout fields will be placed at the checkout steps that configured in the module settings. Admin can also view all the information on the order page in the checkout fields tab.